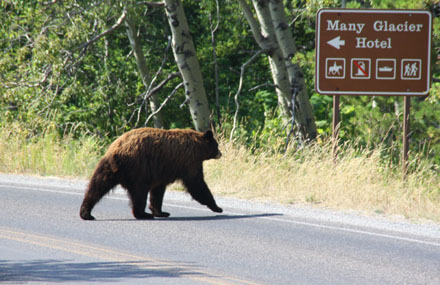 Warning: Don’t get out of your car when bears are nearby. Yeah, right. I’m staying in the car when dozens of other people are scurrying along the roadside to get the best photos of the black bear nibbling berries in front of us? Maybe it wasn’t the smartest thing I’ve done when traveling, but it was one of the most exciting. In fact, I had the opportunity several more times during our August trip to Glacier National Park in Montana. The count during our five-day visit: 10 black bears and one grizzly plus numerous elk, moose, fox, mountain goats, and various small ground creatures like squirrels, chipmunks, and marmots—all viewed up close and personal. 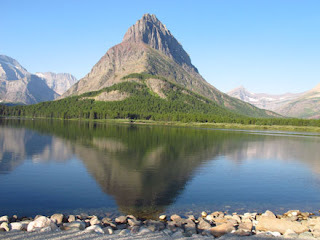 Wildlife viewing is a favorite pastime in Glacier National Park—a great reason to put this park on your travel “short list.” But there are also other reasons why you should plan a visit--now. Only 26 of the 150 glaciers that existed in the park in the 1850s are still there today. And for most of those, visitors see just remnants of ice high in the mountains. It’s estimated that there won’t be any more active glaciers in the park by 2030. Even without wildlife and glaciers, the mountains and lakes provide some of the most spectacular scenery in the United States. 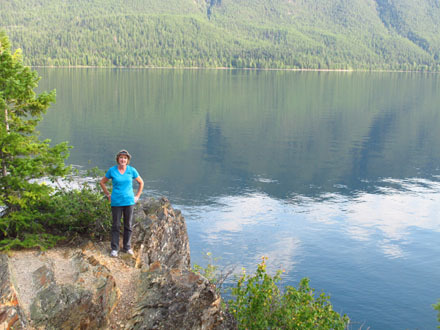 Whether you view it from hiking trails, boat rides, private or tour vehicle, or while sipping a glass of wine at one of the park’s original lodges, the vistas will become etched into your heart and mind. Every turn in the road, every direction you look, there’s another landscape you’ll want to remember forever. Early fall is a great time to visit Glacier National Park. Golf packages are available for guests staying at Grouse Mountain Lodge until September 22. From September 20 through May 15, 2016, book three consecutive nights at Grouse Mountain Lodge and the fourth night is free. As summer ends, it’s prime time to enjoy a beautiful drive or take a breathtaking hike on one of the trails. Explore the changing landscapes and get your third night free when you stay at any of the park’s properties now. Book online or call 406-892-2525 to reserve. Glacier encompasses one million acres, so it’s really not practical to try seeing it all in one visit. We chose to stay in two distinctly different areas, although we drove through additional regions of the park. We entered the park at St. Mary’s and still had about 50 miles to drive to the southern forested region around Lake McDonald. The cottages were small and rustic, but the lake, the largest lake in the park at 10 miles long and 472 feet deep, was lovely and the setting serene. We also stayed at Many Glacier on the east border, which, along with Swiftcurrent, is known as an excellent wildlife corridor—a fact we found to be very true. In order to enter Glacier National Park at Many Glacier, we had to exit the boundary and re-enter at the MG ranger station. But that provided excitement in the form of an opportunity to watch a large grizzly bear graze his way through a stand of berry bushes very near the road. 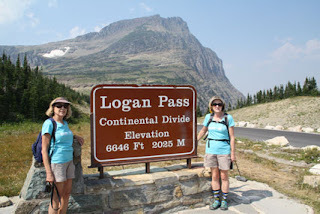 Of course, we (my husband Larry, actually) drove on the amazing, curvy Going to the Sun Road (a highlight of our park touring) to Logan Pass Visitor Center as we made our way to Many Glacier. If you're not comfortable behind the wheel, take a guided tour--but don't miss this experience. The hike to Hidden Lake near there is one of the most stunning paths anywhere. Wildflowers brightened the trail even though patches of ice remained in late August. It’s a doable hike for most people, as are many of the trails in Glacier. 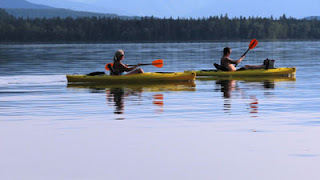 Sections of the park are well-suited to backpackers and overnight campers, but staying in original park lodges and learning the history of these accommodations adds to the Glacier park experience. Just be sure to book far in advance for a summer visit.